The US dollar rallied nearly 5.75% off yesterday's low to push through the 200-day moving average (~JPY106.60) for the first time since early this year. It is at its best level in 3.5 months. 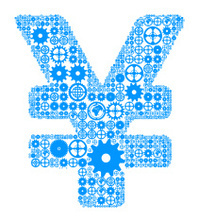 The next technical target is near JPY107.50. Technical indicators are getting extended, but no sign of an imminent top. The note of caution is that the dollar is that it is above the upper Bollinger Band (~JPY106.10). The main driver is the rise in US yields relative to Japan. The US 10-year premium over JGBs is 2.12% today, the most in 2.5 years. It was at 1.55% as recently as early-September. A similar story is to found in the US 2-year premium. It stands at 1.17% today, the highest since the period around Lehman's demise in 2008. Interest rates have replaced equities, a proxy for risk on/risk off, as the driver of the dollar-yen pair. As this Great Graphic from Bloomberg illustrates the dollar-yen has seen its correlation with the S&P 500 slide from around 0.60 in June. It was still around 0.50 in early-September. It was negatively correlated in October and is now positive but statistically insignificant. The wider interest rate premium, which is also evident vis a vis Europe should encourage Japanese investors to buy more foreign bonds. They have been sellers of foreign bonds for the three consecutive weeks through November 4. We continue to anticipate foreign investors will return to the Japanese stock market after divesting JPY8.25 trillion in the first nine months of the year. Over the past month and three months, the Nikkei has outperformed the other major bourses. Global equity fund managers might need to buy more Japanese shares if they were underweight. Otherwise, they will underperform benchmarks. Given the interest rate differentials (for forward pricing) and cross currency basis swaps, one is paid to hedge yen exposure. Our impression after talking with Japanese officials is that a Fed hike and the backing up of US interest rates is wholly desirable. The shift in BOJ policy in September toward targeting the 10-year yield came at an opportune moment. Over the past five sessions, as the 10-year US yields have risen 29 bp and Germany 14 bp, the 10-year JGB has risen barely two bp.